Cholesterol is a soft, wax-like substance found in all parts of the body. Your body needs a little bit of cholesterol to work properly. But too much cholesterol can clog your arteries and lead to heart disease. Cholesterol blood tests are done to help you and your health care provider better understand your risk for heart disease, stroke, and other problems caused by narrowed or blocked arteries. The ideal values for all cholesterol results depend on whether you have heart disease, diabetes, or other risk factors. Your provider can tell you what your goal should be. Some cholesterol is considered good and some is considered bad. Different blood tests can be done to measure each type of cholesterol. Your provider may order only a total cholesterol level as the first test. It measures all types of cholesterol in your blood. Lipoproteins are made of fat and protein. They carry cholesterol, triglycerides, and other fats, called lipids, in the blood to various parts of the body. Everyone should have their first screening test by age 35 for men, and age 45 for women. Some guidelines recommend starting at age 20. Every 5 years if your results were normal. More often for people with diabetes, high blood pressure, heart disease, stroke, or blood flow problems to the legs or feet. Every year or so if you are taking medicines to control high cholesterol. A total cholesterol of 180 to 200 mg/dL (10 to 11.1 mmol/l) or less is considered best. You may not need more cholesterol tests if your cholesterol is in this normal range. LDL cholesterol is sometimes called "bad" cholesterol. LDL can clog your arteries. You want your LDL to be low. Too much LDL is linked to heart disease and stroke. Your LDL is most often considered to be too high if it is 190 mg/dL or higher. Health care providers have traditionally set a target level for your LDL cholesterol if you are being treated with medicines to lower your cholesterol. Some newer guidelines now suggest that providers no longer need to target a specific number for your LDL cholesterol. Higher strength medicines are used for the highest risk patients. However, some guidelines still recommend using specific targets. You want your HDL cholesterol to be high. Studies of both men and women have shown that the higher your HDL, the lower your risk of coronary artery disease. This is why HDL is sometimes referred to as "good" cholesterol. HDL cholesterol levels greater than 40 to 60 mg/dL (2.2 to 3.3 mmol/l) are desired. VLDL contains the highest amount of triglycerides. 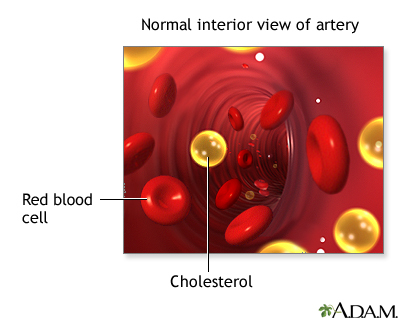 VLDL is considered a type of bad cholesterol, because it helps cholesterol build up on the walls of arteries. Normal VLDL levels are from 2 to 30 mg/dL (0.1 to 1.7 mmol/l). Sometimes, your cholesterol levels may be low enough that your provider will not ask you to change your diet or take any medicines. Gennest J, Libby P. Lipoprotein disorders and cardiovascular disease. In: Bonow RO, Mann DL, Zipes DP, Libby P, eds. Braunwald’s Heart Disease: A Textbook of Cardiovascular Medicine. 109th ed. Philadelphia, PA: Elsevier Saunders; 20151:chap 45. Marathe PH, Gao HX, Close KL. American Diabetes Association Standards of Medical Care in Diabetes 2017. J Diabetes. 2017;9(4):320-324. PMID: 28070960 www.ncbi.nlm.nih.gov/pubmed/28070960. Stone NJ, Robinson J, Lichtenstein AH, et al. 2013 ACC/AHA Guideline on the treatment of blood cholesterol to reduce atherosclerotic cardiovascular risk in adults. J Am Coll Cardiol. 2014;63(25 Pt B):2889-2934. PMID: 24239923 www.ncbi.nlm.nih.gov/pubmed/24239923. Stone NJ, Robinson JG, Lichtenstein AH, et al; 2013 ACC/AHA Cholesterol Guideline Panel. Treatment of blood cholesterol to reduce atherosclerotic cardiovascular disease risk in adults: Synopsis of the 2013 American College of Cardiology/American Heart Association cholesterol guideline. Ann Intern Med. 2014;160(5):339-343. PMID: 24474185 www.ncbi.nlm.nih.gov/pubmed/24474185.